Have you taken specialized education in IT sector? If yes and now looking any IT Job Opportunity in government sector than Chekrs comes up to your expectations. Here we provide you the IT Jobs for Freshers you have been searching across. The Government Jobs in IT Sector 2018 are on its boom. The scope ranges for all in different prestigious departments that one asks for. We list down every possible option of IT Graduate Jobs an even IT Diploma Govt Jobs coming from the reputed institutions working under MEITY. You can easily view IT Government Jobs 2018 being updated daily over here so that you can easily know which jobs to appear for. The IT Jobs are released in every other jobs varying for the posts. The jobs in the IT department range from IT instructor, fitter, informatics assistant, developer, web designer, etc. However all such options can be further taken in favor as per your convenience to view IT Govt Jobs in Rajasthan, Madhya Pradesh, Bihar, Chandigarh, Hyderabad, Delhi, etc. 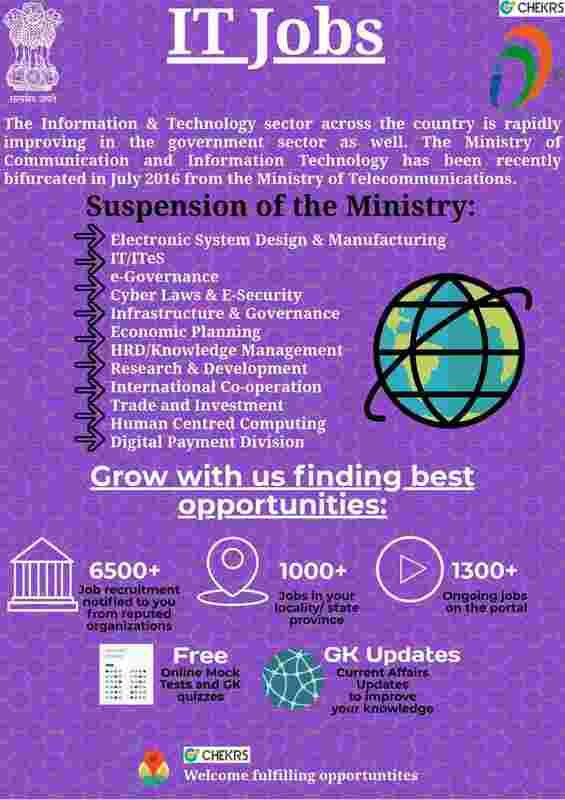 You can receive Latest IT jobs in Govt Sector in your field of interest by taking the subscription of Chekrs. Why Chekrs for Upcoming IT Recruitment? While navigating to reach the final destination we accompany you till you succeed in getting IT Sarkari Naukri. To fill out your preparation with best options we provide you study material that can be useful while giving the examination. The study material provided by us comprises of the previous papers, model papers, free mock tests for exams and also the quizzes that can be helpful in improving GK.